Used Anchors - 100 Kgs to 20000 Kgs.available at our stock. Most of the Type and Kind of anchors available at our stock. Used Marine AC-14 HALL Stockless Spaek Delta Anchor. We offer Marine Anchor at the best prices in the market. Our range of Marine Anchor is dimensionally accurate and finely finished.We ensure Used Marine Anchors, that we supply, are of reliable quality and are well maintained. We possess a diverse range of Used Marine Anchors made with modern technology. This claw-shaped anchor was designed by Peter Bruce from the Isle of Man in the 1970s.Bruce gained his early reputation from the production of large-scale commercial anchors for ships and fixed installations such as oil rigs. The Bruce and its copies, known generically as "claws", have become a popular option for small boaters. Supplier of all types of ship anchor. 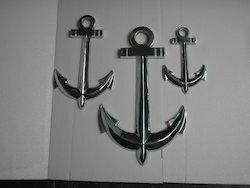 We offering a wide range of anchor in different styles. these are made of superior quality of raw material and used to determine the flawless performance. These products are available in different specifications as per our clients and are widely known for their long working life as well as stability. We are leading supplier of different kind of Marine anchors. Please feel free to contact if you want ship's large Marine anchor. Staring from weight 100 kilo to 10000 kilo. We are a well-reckoned Gujarat based Supplier and Exporter of the best quality Marine Anchor. A symbol of reliability and stability, the Marine Anchor that we offer is highly demanded in marine industry. We are engaged in making available Marine Anchor in various sizes. Durable and top grade Marine Anchors can be availed form us at very competitive prices. We are Supplier and Exporter all types of used/reconditioend/reusable/second hand marine ship Anchor from ship recycling yard alang india. Our organization is indulged in offering Boat Anchor to our clients. These boat anchor can be customized as per our precious customers specifications. These boat anchors are widely known for its durability and quality. We prepare from 800 gms to 500 kgs. Usually we deal in four arrow anchor and five arrow anchor. We can also customize as per requirement. We are supplying different types of Chains & Anchors. Over the years, we have mastered the art of providing high quality services to our clients related to the supply of these accessories for naval marine uses. These services are always prompt, reliable and cost-effective that are aimed at customers' application requirements.